Blockchain, artificial intelligence (AI), machine learning and Big Data will transform capital markets, according to German stock market operator Deutsche Boerse. 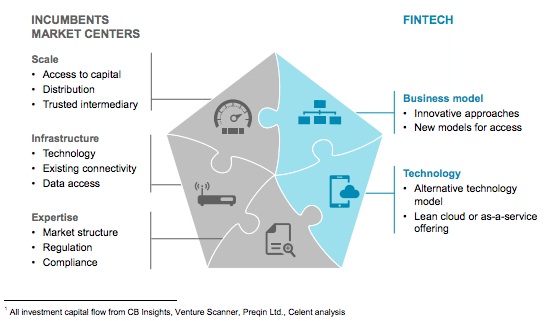 It urges established financial infrastructure players to start approaching fintech firms and consider partnering with these innovative ventures. 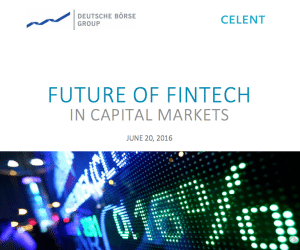 In a new report entitled ‘Future of Fintech in Capital Markets,’ Deutsche Boerse, in collaboration with fintech research and advisory firm Celent, analyzes the potential impact of fintech on market infrastructure incumbents and highlights the opportunity for providers in partnering with these new innovative ventures. According to David Easthope, senior vice president and responsible for the securities and investments practice of Celent, pioneering fintech firms are transforming major parts of the financial services ecosystem. He urges incumbents and fintech firms to start pursuing a collaborative approach, arguing that fintech will mostly likely shape the future of capital provision, technology, and other industry workflows. In 2015, about US$19 billion in capital was invested globally in fintech across approximately 1,200 deals, highlighting the general appetite for financial services disruptors. Blockchain technology and distributed ledgers have the potential to substantially change the nature of issuance, and potentially enhance exchanges’ role in price discovery, access liquidity, reduce frictional costs and offer a path to a more efficient core market infrastructure. Post-trade digitalization: firms are looking into Big Data, AI and advanced analytics to process and create compliance and regulatory reporting. Regulatory technology (regtech) is an opportunity for incumbents to improve their operational efficiency, reduce systemic risk, and provide additional revenue-generating opportunities. Machine learning, predictive analytics and Big Data technologies, will impact capital markets by providing tools to mine data across the value chain. New methods of data delivery and tools for insight and prediction will allow firms to make better decisions around allocation and risk, and investors to gain access to next-gen index products, ETFs, as well as other innovative trading and investment products. Investment technologies, including automated investment management tools or robo-advisors, are gaining relevance as the industry continues to shift towards automation in asset allocation and rebalancing. On the retail side, customers are shifting to cloud-based digital solutions that are accessible in terms of pricing as well as usability. Alternative funding platforms and peer-to-peer business models are reshaping traditional channels for equity and debt capital formation, opening up new networks for accessing capital. Financial market organizations can capitalize on this trend and provide new solutions to the financing and funding market. As trends in digitalization accelerate, established technology firms and market operators will need to collaborate with new business models and innovative technologies. 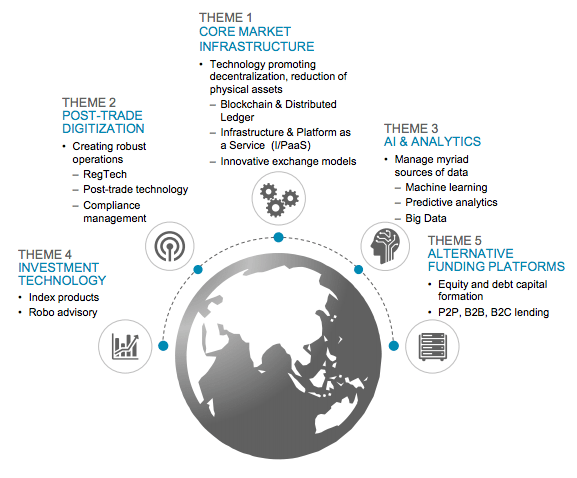 “Market participants need to continually evolve and innovate their business models,” the report says. The report was released simultaneously with the announcement of Deutsche Boerse Group’s new corporate venture capital platform, DB1 Ventures. 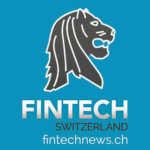 The team, based primarily in Frankfurt, said it will invest in early to growth stage fintech firms and manage the group’s existing portfolio of investments. According to Carsten Kengeter, CEO of Deutsche Boerse, the idea behind DBI Ventures is to allow the group to continue on being an active investor in the space. DBI Ventures will primarily focus on ventures and products that “are core or adjacent to our client, product, geographic and technology strategy,” according to Kengeter. Committed to keeping up with emerging fintech trends, Deutsche Boerse has been involved in the space via various means. In April 2016, the group launched its Fintech Hub in Frankfurt, an initiative aimed at acting as a cluster for German financial innovation. Deutsche Boerse is also an investor in Digital Asset Holdings, a developer of distributed ledger technology for the financial services industry. In November 2015, it invested in Illuminate’s IFM Fintech Opportunities Fund, which focuses on areas such as compliance, regulation and connectivity. In July 2015, Deutsche Boerse acquired forex trading digital platform 360T for 725 million euros.